First National Van Lines is in the business of making moving easier for their customers. As a full-service moving broker specializing in both residential and commercial moves, First National Van Lines organizes local, out-of-state and international moves. 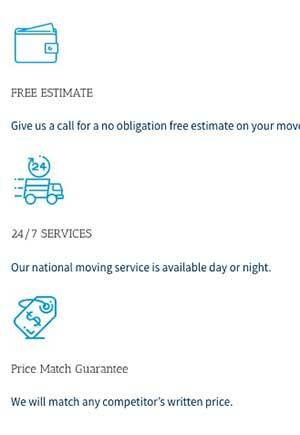 With their price-match guarantee, you know you’re getting the best price for moving services. First National Van Lines is a full-service moving broker offering local and long-distance moving packages. It also provides packing and storage with 30 days of free storage. First National promises a price-match guarantee on any competitor's written price. Headquartered in Newton, Iowa, First National Van Lines is an interstate moving broker licensed by the U.S. Department of Transportation. Moving brokers coordinate the transportation of your items using carriers authorized by the Federal Motor Carrier Safety Administration (FMCSA). Using a broker like First National Van Lines can save you time because you don’t have to coordinate with multiple moving companies yourself. Moving brokers often have access to lower rates than you would as well. First National Van Lines coordinates moving your home or office, an entire company or can arrange shipping for things like furniture to your house or business. Moving options include packing services and holding your shipment in a convenient storage facility, so it’s ready to unpack when you are. When you work with First National, a professional agent makes all the arrangements for picking up furniture, boxes and other items from your location, then securely transporting the belongings to your destination. Interstate moves sometimes require using more than one truck or carrier, and as a moving broker, First National Van Lines coordinates the move at the most reasonable cost. The cost of any move depends on several factors like where you live, how far you are moving, how much your belongings weigh, and the time of year you choose to move. Because so many factors play into each move, we can’t offer sample prices from First National Van Lines. However, online customer reviews show moving costs from $1,100 to $18,000. That price range is broad because First National Van Lines moves businesses as well as individuals across the country. First National Van Lines is one of the few moving brokers to offer a price-match guarantee. First National promises to meet or beat any competitor’s written price. To get a quote from First National Van Lines, use the quote form on their website to enter your name, phone number, email, ZIP codes for both original and destination cities and the anticipated move date. Alternatively, you can use the chat feature on the website or call the company to give your information to an agent. After the agent ensures they have all the details needed, a transportation professional will get in touch with the carrier who will load up and haul your belongings. First, you will receive a rough estimate mainly depending on the size of the household or business you are moving. While First National Van Lines can transport a large estate or business as efficiently as a small apartment, the size of the property determines the total weight of the items moved. A state-to-state move is billed based on weight, so the accuracy of the initial quote depends on how well you describe your property to the agent. Be sure to include all rooms, storage areas, attic, garage and outbuildings. If you accept the initial quote, First National will arrange for a representative to take an inventory of your belongings at your home or office to provide you with a final, firm quote for moving costs. Keep in mind the loaded truck weight determines the final cost of your move, which can vary because no two desks, beds, couches, or other items weigh the same amount. If you get a binding estimate, the amount you pay First National is guaranteed. Since it’s difficult to estimate the actual weight of the load, a non-binding estimate is not unusual, but your final charges depend on the weight of all your belongings and the tariff provisions. The majority of the consumer reviews found on sites like Yelp, Business Rater and Trust Link rate First National Van Lines at a healthy 4 or 5 stars. Customers frequently mention the professional and helpful the staff and how trouble-free the move was. The Better Business Bureau rates First National Van Lines an “A+” with 4.75 out of 5 stars based on 41 customer reviews. The company responded to all but one of 19 complaints filed in the past 12 months, and the company responded to all but one. Seven complaints were filed against First National with the Department of Transportation this year, mostly centered around pickup and delivery issues. Will First National Van Lines pack and unpack moving boxes? Yes. At the customer’s request, First National Van Lines will coordinate with a service to pack all or some of a customer’s belongings for a move. First National also offers an unpacking service once your shipment arrives at the destination. These services are provided at an additional cost, so ask about fees. Are there any items First National Van Lines can’t move? Yes. By law, flammable materials, combustible or explosive items, poison, plants and perishable foods can’t be legally shipped by any mover regardless of the distance. Can First National Van Lines arrange for one trucking company to move my home? The professional movers First National Van Lines works with know how to use every inch of space on the moving van. Most likely the truck that picks up is the same that delivers if your items fill the trailer. If your belongings don’t fill the van, your load can be transferred to another trailer down the road to keep costs down and make the promised delivery date. This practice is standard across the interstate moving industry. Why should I use First National Van Lines if I still have to work with the movers? Brokers like First National Van Lines have relationships with different movers and can negotiate lower rates for you. Brokers also know how to avoid problems while moving, can navigate legal requirements and permits, and can manage your move more effectively than you can on your own. How do I know which carriers will handle my belongings if I use First National Van Lines? Moving brokers are required to by law to provide customers with a list of the transportation companies they use. First National will give you a copy of their carrier list as well as a copy of Your Rights and Responsibilities When You Move by the FMCSA. Moving can be an extremely stressful event. Having professionals like the agents at First National Van Lines manage your move will save you time and can take a great deal of weight off your shoulders, so you have time to focus on the details of your relocation. First National’s price-match guarantee can save on moving expenses as well. To get a moving quote from First National call 888-241-8660 or get a quote online. My moving went perfectly well! I’m totally surprised to be quite frank, I remember how it was when I was a small kid, so I mentally braced for the worst. I called several companies to get quotes from them and choose First National Van Line (they offered services on a turnkey basis!). They packed all family stuff and furniture. At the new house they unpacked installed everything we asked. I recommend this moving company. Great approach and good pricing. They did everything I wanted and even more. I moved from Texas to California and First National Van Line provided me quality service. The drivers were punctual, the staffs helped to pack the items and even assisted with unpacking the items. I am a satisfied customer. I recently relocated from California to New York with the help of First National Van Line. The cost was fair enough for the number of items I was moving, and there were no additional charges in the end. I recommend their services to everyone. They could not have done a better job, very professional from beginning to end. My moving rep Christian was extremely detailed and always kept us in the loop which I appreciated. Price was reasonable and did not change. Strongly recommend. So overall we had a good experience with First National Vanlines. Me and my husband relocated my parents from GA to FL this past year and it was a smooth move. They had a lot of stuff and it was quite expensive but overall a fair price. Thanks again to the team at First National Vanlines for all of your help and kindness. So my parents relocated me from CA to AZ to transfer to finish college and we used First National Vanlines. They did a great job and we were very satisfied with the services as a whole. The delivery was delayed a day because of bad weather but this was not a big issue. Me and my family were very pleased with the overall services we were provided. Thanks again First National Vanlines for all of your help. We will use your services again when needed.